We’ve all read blog posts mapping out our best chance for productivity, right? Ever read one and just think, “Not a chance”? As moms, juggling our kids, errands, hobbies, business, etc. turns our quest for productivity into a search for the Holy Grail. Therefore, we’re going to spend today looking at a realistic daily schedule for stay-at-home moms. I really do think that would be the perfect day. I mean, a two-hour lunch break to just read a book? Or even nap? The problem is, this beautiful schedule is simply unobtainable for stay-at-home moms. It’s not Meese’s fault; he didn’t write it for us. But too often, I think we see this as the ONLY option and throw in the towel when we can’t keep up. How can a stay-at-home mom physically get up at 6:00 AM and expect to get something done after waking up three times in the night to soothe a teething baby? And approximately how many lunch breaks do you get, mama? How about that “work until dinnertime” notion? Guess who’ll be right at your ankles every seven minutes asking for a snack if you’re not in the kitchen working on dinner? Hear me out. Til my dying breath, I’ll tell the world that being a mom is the greatest gig in the world. But if I want to find a balance that actually fits my lifestyle, then I need to let go of a few expectations. You can’t expect to function with the same schedule as a breadwinner. If you signed up to be the stay-at-home mom, then your priority lies with the munchkins. Do you still deserve time to yourself each day to recharge? ABSOLUTELY. You just need to find it in different ways. Sometimes, that means swapping childcare with another mom once a week. It might mean establishing quiet time every afternoon if the children don’t nap anymore so you can have an hour to yourself. You could even hire a sitter to watch the children one day a week if that’s what it takes to give you balance. You can’t expect the schedule you implement today to still work in three weeks. When I first became a freelance writer, I made a simple goal to write each morning at 6:30. That worked for approximately two weeks until my infant began teething through the night and my toddler suddenly wanted breakfast at 4:00 AM. I was a hot mess trying so hard to stick to my writing schedule. Changing my plans felt like failing, but you know what? It’s exactly what needed to happen. So, I extended myself some grace, slept when my kids slept and started swapping childcare with a friend to accomplish my writing tasks. Pre-Breakfast – Tend to yourself – Whether that means to sleep in, read, exercise, shower, or just sip coffee in silence. Morning – Tend to your family – Spend this time intentionally caring for your little ones: i.e. Make breakfast, get the children dressed, make crafts, go on playdates, visit a library. Lunch – If you’re planning time in the afternoon for your hobby or at-home business, then find creative and simple finger foods to make for lunch. An elaborate, three-course lunch will zap your afternoon energy reserves faster than a hailstorm. Use wraps to make PB&J roll-ups, for example. The less clean up, the better. Afternoon – Naptime/Quiet time – Once the kids are down for naps or have a few activities to play quietly in their room, it’s time to clock in. If your kids are anything like mine, then they like to sneak out of their rooms and check if quiet time is done approximately 18 times, no matter how nicely (or firmly) you ask them to stop. If that wrecks your concentration like it does mine, then leave the heavy focus for child-free time. For example, I can email, design social media graphics, or outline during quiet time, but I can’t write a chapter in my book. Evening – Family time – Maybe your brain is able to function once you’ve cooked dinner, fed the family, cleaned up, bathed the kids, read them stories, and said good night, but I’m absolutely FRIED after 8:30 PM. My best move is to hang out with my husband watching Netflix or read a book. If you can work on your hobbies and interests, then go for it. By the way, if you’re looking for ways to make money from home, check out these 14 jobs that are worth a stay-at-home mom’s time! 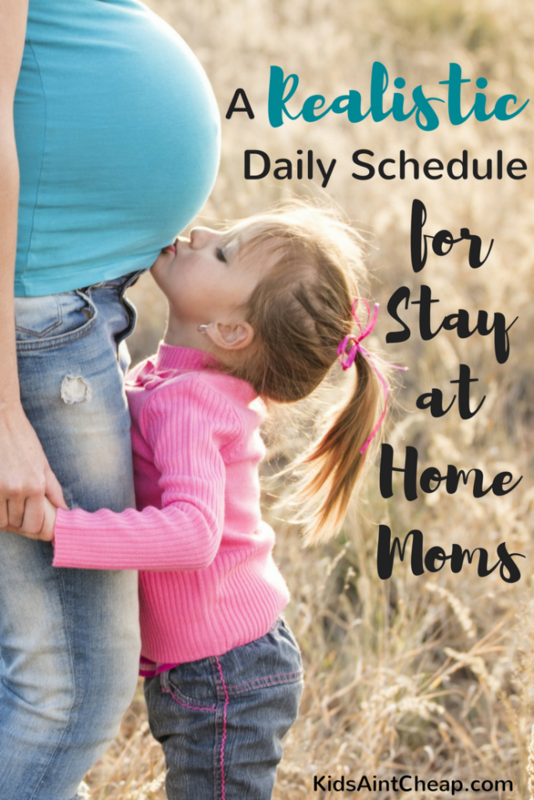 This daily schedule for stay-at-home moms is obviously just one broad stroke of the paint brush. Your life and your interests will look differently once applied to this list. Therefore, let’s hear how you find the most balance in your week. Share some of your best ideas for a daily schedule in the comments below!